Chicken soup is not only good for the soul (I love the Chicken Soup series of books) but it is good for the immune system too. Seeing as this is soup month, and Tuesday is recipe day, I'm sharing my mother's chicken soup recipe. I grew up with this soup and I've made it regularly each winter since I left home. My kids have grown up with it too. It is the only chicken soup Hannah will eat. This soup is warming when you're well. When you're not well it is soothing and comforting and healing all in a bowl of tasty, steaming goodness. I know I've shared this recipe before, but if you've lost it, can't remember where it is filed or have never made soup before this is the one to try. It really is easy, even if it seems fiddly to make. Give it a go, you won't regret it. And if you would like to make it cheaper, use a chicken breast and three chicken frames instead of the whole chicken and reduce the cooking time in Step 2 to 20 minutes. 1. Put a small quantity of each vegetable aside. Put the remaining vegetables into a large pot, add the parsley, black peppercorns and the bay leaf. 2. Put the whole chicken into the pot and add the salt. Add just enough water to cover the chicken. Bring to the boil, then turn the heat down and simmer for 40 minutes. Remove from heat. Put a dinner plate over the chicken and vegetables to hold them down in the broth. And allow to come back to room temperature. 3. Put the whole pot into the fridge. When the fat hardens, skim it off with a spoon. 4. Take the chicken out of the pot and pull it apart. Put the meat on a plate and set aside. Put the skin, bones and fat back into the pot and bring to the boil. Simmer for 1 hour. 5. Cut the cooked chicken meat into bite sized pieces. 6. Strain the contents of the pot. Keep the liquid but add the vegetables, bones etc. to your dog's dinner (take out the bones first) or to the compost. 7. Just before you are ready to eat, simmer the reserved vegetables and liquid for about 5 minutes then add the cooked chicken. 8. Warm the soup through and serve. Good soup take time and love. This is similar to mine and yes, the dog does get the bits and she says thank you very much. 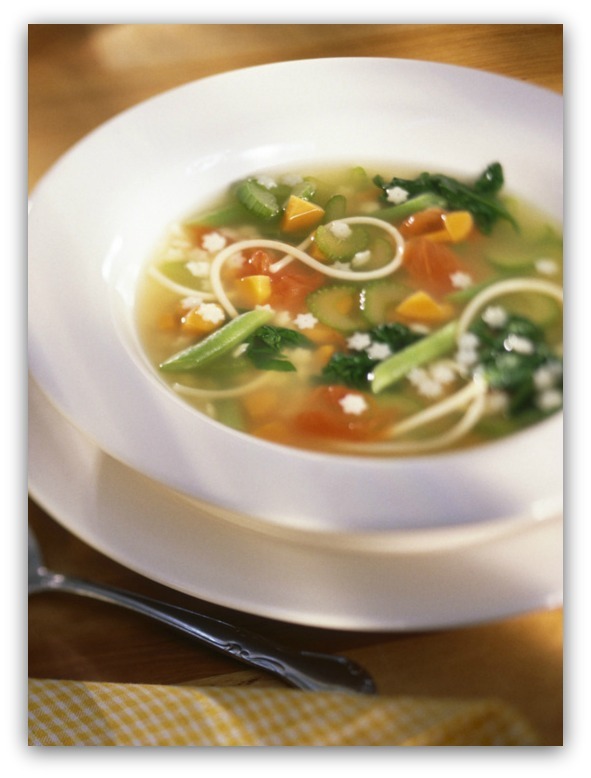 Lynda this is my "go to" soup whenever someone in the family is sick, we all love it. I often make it to have for afternoon tea on those really bitter winter days. I'd have it hot and ready to pour into a mug as soon as the kids came in from school and they'd wrap their hands around their mugs to warm them while they sipped the soup, these days they're all looking for it when they come in from work.